Jetske Germing, Open Government Wales Officer at WCVA, was at the launch of the exciting new Open Government Pioneers project in Wales last week and here she tells us all about it. Only a short while into the project we feel grateful to have had a high profile opportunity to launch the Open Government Pioneers project in Wales on the 7th March at the gofod 3 event. 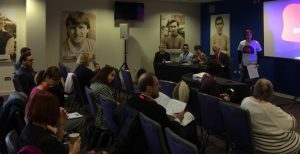 The aim of the Open Government Pioneers project is to link civil society networks across the UK to help share tools, techniques and resources to engage better with governments, around the United Nations Sustainable Development Goals, which in Wales will focus on the Future Generation Goals. The panel discussion chaired by Anna Nicholl, Director of Strategy and Sector Development at WCVA started with an introduction to the panel’s work in relation to Open Government and their hopes for the Open Government Pioneers Network in Wales. Caren Fullerton, Chief Digital Officer Welsh Government told us about the three main parts of Welsh Government’s journey regarding Open Government: 1) to modernise Information Technology; 2) to modernise Welsh Government’s Digital Services and 3) around data. To date there are a number of examples of the work Welsh Government already undertake, such as publishing 200 datasets. Caren explained that the problem is that no one knows they are there. The Open Government Action Plan 2016-18 aims to change this and Welsh Government recognises the need to engage with civil society groups for the next series of commitments. Kevin Davies, Head of Engagement National Assembly Wales explained that engagement for the Assembly is about performing, involving and empowering. The Assembly have changed to a participatory model, and direct engagement. This makes scrutiny more robust, giving better quality and better legislation. Kevin explained that although the Assembly is not covered by the Wellbeing of Future Generations Act it recognises its importance, especially around involvement and collaboration. The Assembly aims to make content and data easier to access and source and to increase capacity of civil society to mobilise more democracy. In terms of the Open Government Network for Wales, Kevin hopes the network will work towards providing citizens with greater access to information, and increase capability and capacity within civic society to reflect and represent the views of citizens so that people feel closer to the democratic institutions which works to serve them, and to mobilise a more democratically active society. Peter Davies, Chair of WCVA Trustee Foundation for Democracy and Sustainable Development and Chair of the Customer Challenge Group Dwr Cymru reminded us that Wales has strong participation levels, with a million active volunteers. He explained that this does not however automatically translate in democratic activity. Peter believes that we need to put users at the heart of services and have a gap to fill in mobilising citizen led activity. He also emphasised the need to work cross-sector and to learn from other sectors, i.e. the customer challenge group he chairs for Welsh Water. Owain Ap Gareth, Electoral Reform Society explained that the Open Government agenda covers across different levels, from participation to direct democracy and a host of policies. The work of the Electoral Reform Society is focusing on increasing the capacity of Assembly Members, and alongside this it is essential that people get involved to succeed. Owain highlighted how citizens need to be active, by explaining that as Wales is such a small country this means that not only do we need to do the ‘nice bit’ around participation, also we need to ‘get as much out of people as possible’. He highlighted that we are part of a wider UK Open Government Network that is joining the dots on what is happening elsewhere already. We need to find a way to harness community data. How do we include people with learning disabilities to have a say within our communities? How do we ensure the user is taken into account in big picture scenarios? What capacity is there for organisations to work in new ways and experiment? In response Caren highlighted that her team have moved on from ‘the risk of using open data’ to ensuring data is considered fully. She answered that there is capacity with Welsh Government to experiment with working in different ways. Kevin echoed this by saying that National Assembly Wales has the capacity to trial, and is actively seeking views. He’s keen for the network to share good and bad experiences. It was evident during the other sessions at gofod3 that there is appetite for groups and individuals to get involved. Throughout the day participants expressed their feelings in clear language, such as ‘volunteering is addictive’ and ‘social care is not very social at the moment’, showing the importance of getting individuals or groups throughout society involved in planning for the future. Perhaps now more than ever, with Brexit and the related pressures on budgets we need to find ways of engaging all sectors to work together for future generations to prosper.